When looking for a cheap gaming monitor, there are a ton of different monitors to choose from. The majority of LCD/LED monitors produced today should be more than adequate for most forms of gaming. But in order to maximize the value you get for you dollar, you want as big of a size as possible, all of the necessary inputs, low latency, all at a price that’s below $200. Amazon happens to be one of the best places for cheap equipment of any kind, but before we take a look at what they have to offer, it’s important to know the kind of the stuff to look for before you spend your money. What to Look For When Buying Cheap Gaming Monitor? Even if it’s a cheap gaming monitor, you want it to work well enough that you don’t become incredibly annoyed, or worse, motion sick, when playing games for extended periods of time. Perhaps the biggest necessary feature of any gaming monitor is a low latency. Most of the time, displays marketed purely as computer monitors won’t include any kind of fancy post-processing, but if they do, it must be turned off in order to have as minimal latency as possible. Additionally, the response time needs to be as low as possible. 2ms tends to be the standard these days, but there are slightly more expensive monitors that can do 1ms. The lower, the better. A high contrast ratio as well as 1080 resolution is also nice, because games tend to be quite varied when it comes to graphics and visuals. And with all that said, let’s take a look at a couple of different models. BenQ is a relatively new company, specializing in high-performance displays for both gaming and professional markets. Their RL2455HM includes full 1080p resolution at 24 inches, DVI and HDMI inputs, ZeroFlicker technology, and an impressive response time of 1ms. For fast-action twitch games, this monitor will be more than adequate, and with a price of $179, it’s a fairly cheap gaming monitor as well. While not specifically marketed as a gaming monitor, the ASUS VS247H-P is nonetheless one of the worthier choices. Coming in at $157, it’s even cheaper than the BenQ model, and includes full 1080p resolution, VGA, DVI, and HDMI ports, built-in power adapter, a standard 2ms response time, and a dynamic contrast ratio of up to 50,000,000:1. It offers a great combination of both low price and great features. Even though the Asus model is slightly cheaper than the BenQ model, you might actually get better value in terms of a cheap gaming monitor if you just go with BenQ. For a slightly higher price, you get a lot in return across the board, including a bigger screen size, lower response time, less flicker, and overall a better feel for high-action gaming. While there are plenty of other monitors you can look at, the BenQ mentioned here has a great balance of price, performance, and features. It is sure not to disappoint any time soon. 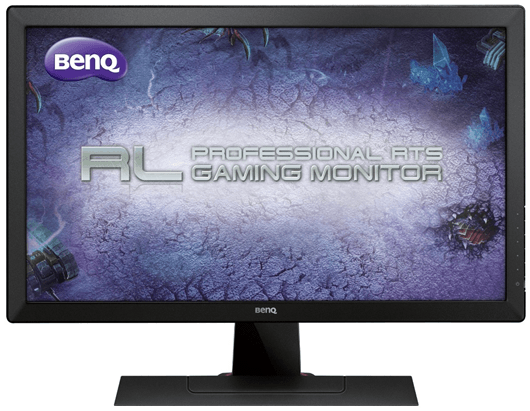 The BenQ RL2455HM gets our whole-hearted recommendation.